Delamere is one of the original vineyards planted in the Pipers Brook region, one of Tasmania�s longest running family owned and operated wine estates. Venture up the winding bush track, past the small quarry and a magnificent old oak tree to the rustic cellar door and winery. The devoted team here are fully focused on producing distinguished sparkling and table wines from the finest harvests of Chardonnay and Pinot Noir. Great value is placed on the varietal expression of these noble cool climate varieties, as well as the distinctiveness of site as reflected through the estate's wines. Through intimate knowledge of vineyard, hands on management and modern winemaking techniques, Delamere take aim at producing wines of complexity, classic cool climate structure and great character. 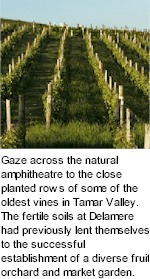 Gaze across the natural amphitheatre to the close planted rows of some of the oldest vines in Tamar Valley. The fertile soils at Delamere had previously lent themselves to the successful establishment of a wonderfully diverse fruit orchard and market garden. It was the pioneering vision of Richard and Dallas Richardson that in 1981, saw the more elevated areas of the property planted out to the classic cool climate cultivars of Chardonnay and Pinot Noir. Over the last 25 years Delamere has forged a reputation as one of Tasmania�s premium still and sparkling wine producers. From deep in the earth come vintages of heavenly wines, reflecting the essence of the landscape, climate and season. All the passion for Tasmanian wines, at similar latitude to the Champagne and Burgundy regions in France, arises from a desire to seek out a genuine cold climate which can produce classically structured vintages, combining fruit intensity with refinement, complexity with persistence of flavour, the ultimate expression of grape, growing season and local terroir. Delamere Vineyards was established on rich ironstone soils perfectly suited to the cultivars of pinot noir and chardonnay exclusively, established in the traditional French layout and design as employed in Burgundy and Champagne. The deep red ferrosol soils offer great fertility, excess water drainage and moisture retention, meaning that irrigation is not required. Delamere is densely planted at 7500 vines per hectare, to a vertical shoot position trellis system with a very low fruiting wire, some 60cm off the ground. The low yield per vine and reflective heat from the ground produces wines with superior depth of flavour and ripe well developed tannins. Vine age and subsequent natural balance are key factors in the consistent production of wines with great structure and harmony. The Pipers Brook region enjoys a significant climatic advantage that's unique in Australia, a very low variability of maximum temperature. This stability is born from a unique set of geographical features, hot northerly winds are cooled by the waters of Bass Strait, while the cool southerlies gain heat as they cross the island. This, combined with cool, relative temperatures and significant sunshine hours make for ideal conditions to retain delicate aromas. The frosty and sometimes wild conditions of winter give way to clear, crisp, blue-sky days through the growing season, allowing the fruit to ripen slowly and evenly, assuring a lingering acidity essential to producing premium cool climate varietals. One of the greatest feelings as a grower and winemaker is to have the opportunity to be so close and connected to the winemaking process from the vineyard to the bottle. All of the processing and bottling at Delamere has always taken place at the onsite winery, a stone�s throw from the vineyard, ensuring that the purity of character is captured in the wines. Tradition continues, Delamere remains, as always, a family owned producer of estate grown and bottled wines. 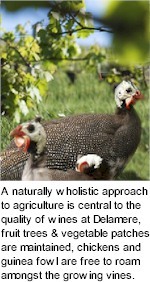 Diversity is very much a feature of the property, with many of the old fruit trees and vegetable patches still existing, and the addition of free roaming chickens and guinea fowl.